"Most of us experience periods in our lives where the tranquil waters of life are appreciated. 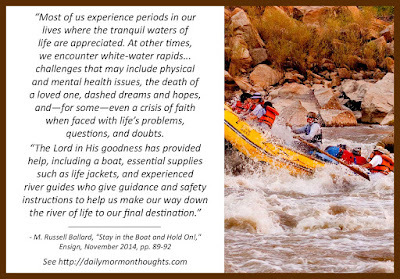 At other times, we encounter white-water rapids that are metaphorically comparable to those found in the 14-mile stretch through Cataract Canyon—challenges that may include physical and mental health issues, the death of a loved one, dashed dreams and hopes, and—for some—even a crisis of faith when faced with life's problems, questions, and doubts. "Let’s think about rule number one: stay in the boat! "Given the challenges we all face today, how do we stay on the Old Ship Zion? "Here is how. We need to experience a continuing conversion by increasing our faith in Jesus Christ and our faithfulness to His gospel throughout our lives—not just once but regularly." 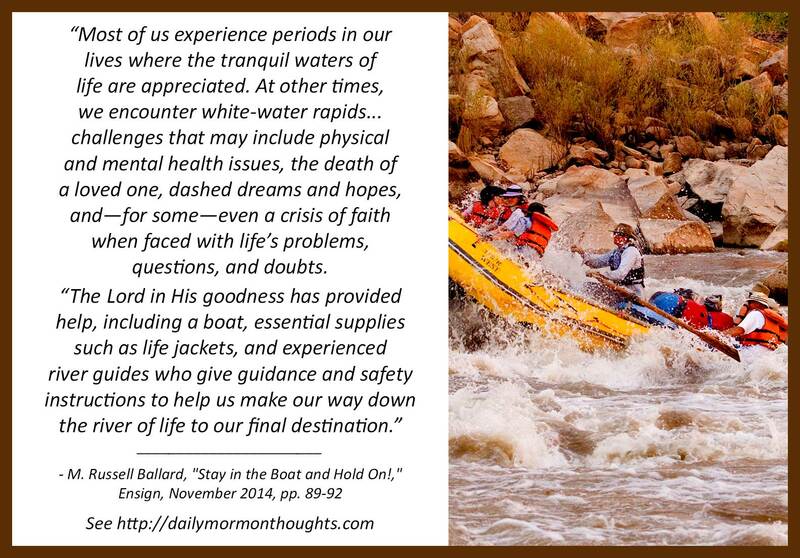 Elder Ballard tells of a friend who took a river rafting trip through Cataract Canyon in southern Utah. He applies some of the lessons learned to life's journey. While rivers have areas of both tranquil water and dangerous rapids, it's the challenge of those faster waters that Elder Ballard likens to the challenges we face in our lives. But there are measures in place to insure safety and successful completion! So the key is to "stay in the boat" and follow the counsel, taking advantage of the safeguards, and enjoy a wonderful journey!